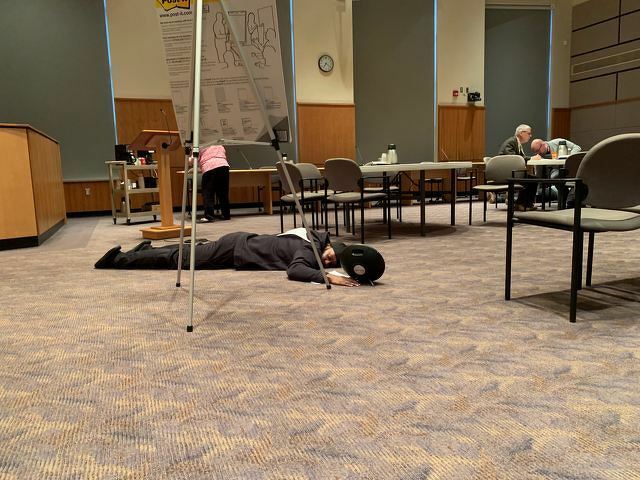 A protestor lies on the floor at a State College Borough Council work session on April 8, 2019. STATE COLLEGE — Several demonstrators staged a lie-in at the April 8 State College Borough Council work session in response to the death of Osaze Osagie, the 29-year-old borough man who was shot and killed by a State College police officer last month. Council was scheduled to workshop its long-range transportation plan with local transportation representatives, as well as discuss the potential Local Economic Revitalization Tax Assistance plan. Council President Evan Myers kicked off the meeting by speaking about the ongoing investigation into Osagie’s death. “In future council work sessions, this council will begin to address these issues and how as a community we can heal, and make sure that we face up to the higher calling of fighting the evils of racism, no matter what the findings of this investigation,” Myers said. Pennsylvania State Police is conducting the outside investigation into the shooting of Osagie, who was African-American and according to his family was diagnosed with autism and had struggled with mental health issues for more than a decade. He was fatally shot by an officer after a confrontation with borough police who had come to his apartment to serve a mental health warrant. “The investigation is ongoing, and we do expect those results at some point,” Borough Manager Tom Fountaine added. At this point in the meeting, the group of protestors entered the room. One demonstrator carrying a CD player sang “God Bless the Child” as six individuals assumed their positions around the room. “We are here to demand justice for Osaze Osagie. We are not here to be negotiated with,” he said. As he spoke, the group handed out a list of demands to the meeting’s attendees. "We demand the officers involved are fired and subsequently charged for their crimes," the demonstrator said. "We demand complete community oversight of the investigation. We demand complete transparency of the events leading up to and including Osaze Osagie’s murder. And we demand funds and resources provided to the family for grief and counseling-related expenses. “If our demands are not met, the protests will continue indefinitely. The demonstrations will continue indefinitely,” he said after outlining the list. “If you have questions about who we are,” he said before leading a call and response chant with the other demonstrators, calling “we are” to the response of “not” several times. He then played a recording that included police sirens and a voice saying “I can’t breathe” as the group lay down on the floor of council chambers. Songs including Billie Holiday’s “Strange Fruit” and Kendrick Lamar’s “Alright” then played from the speaker. After several minutes, Myers began to speak over the music. Myers said it was his hope that the meeting would not be adjourned but that it was up to the demonstrators to come forward and speak. "I’m also very concerned about the things that occurred three weeks ago. I understand why folks are here, why they feel the way they do, but it’s obvious given where we are right now that the meeting we were going to hold tonight will not be able to be held . It’s unfortunate we can't hear the voices of the folks that came here to protest. "We do hope in the future we will be able to. We do know there are community meetings that have been held over the course of not just the last three weeks but over the course of months to make sure we understand what is happening not only in our community but around the country. We have a long way to go. We understand that. The only way we’re going to be able to get there and solve these problems is if we do them together." The demonstrators remained on the floor for about 20 minutes after the meeting had concluded before exiting the room. Issues of race and mental illness have been at the forefront of community conversations, and heightened tensions, about his death. After the shooting, state police seized several 9 mm casings, bullet fragments, a taser and a knife from Osagie's kitchen at the Marvin Gardens apartment complex. A state police official reportedly said that borough police used a taser first but that it was not effective. Through his attorney, Kathleen Yurchak, Sylvester Osagie told StateCollege.com that he was actively looking for his son at the same time as police and that he expected a phone call if they found him adding that he had contact information for mental health professionals who are trained to handle such situations. The officers involved have been placed on administrative leave, per State College Police Department policy, pending the outcome of the investigation. StateCollege.com managing editor Geoff Rushton contributed to this report.